Michelle’s inspiration for Flower Market: Botanical Style at Home is the wide variety of seasonal plants and flowers available right outside her shop. Buying locally and in tune with the seasons is at the heart of her philosophy Using salvage and reclaimed objects, vintage glassware and ceramics as props and backdrops, Flower Market is brimming with texture, pattern and exciting and inspiring ways to group and display flowers, plants and succulents. Designer, illustrator and co-owner of successful vintage emporium Mason & Painter, Michelle Mason is passionate about interior product design. Known for her strong illustrative style she continues to inspire with exquisitely designed products for clients including British Library, Transport For London and St Pancras International. Endorsed as “the stylist’s favourite” by the Sunday Times Style magazine, Michelle has worked with some of the UK’s most established manufacturers from the potteries of Stoke-on-Trent to Sheffield’s last remaining pewter factory. Her own products have regularly appeared in the international design press and she frequently sits on judging panels, such as Boost, launched by the Southbank Centre and the Observer to find the next generation of new design talent. Mason & Painter opened in Columbia Road, London E2, in 2013 to great acclaim and Michelle was immediately invited to create pop-up stores at the Southbank Centre and Kew Gardens. 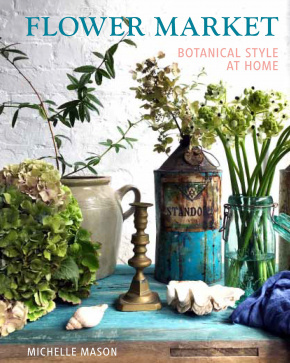 Her interest in styling with flowers and plants is intrinsically linked to the flower market; which literally unfolds on her doorstep every week and where she gathers seasonal produce to decorate the shop. She has been featured in articles for Guardian Weekend, Sainsbury's magazine and Living Etc and has contributed articles to Design Exchange and Trail Blazer magazines.